I’ve just had one of those particularly busy weekends we get from time to time when we reach a pinch point in the project. Many people look at what we’re doing and wonder how we fit it all in. And the answer is…. with a lot of work. 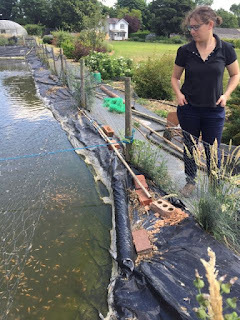 And, sometimes we simply don’t have enough time to keep up and have to compromise on the timing of some aspects of the breeding process. We’re in one of those pinch points now, and it’s a race to harvest the ponds – in full; and then prepare them in quick time for rearing another batch of hatchlings. There's been so much to do, that the rest of the family are starting to help out where they can. 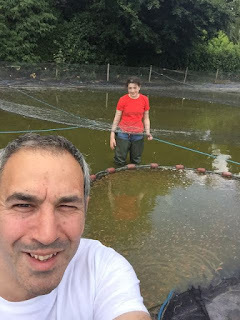 My eldest daughter helped me for the full day on Sunday - when we harvested the top pond , pumped out the bottom pond, and then cleared out the remaining fry that collected in the drainage sink. Selfie of Annabel and myself, after a day of harvesting koi fry. One of the best day's I've had in a long time, being able to enjoy an activity like that, working with my daughter. 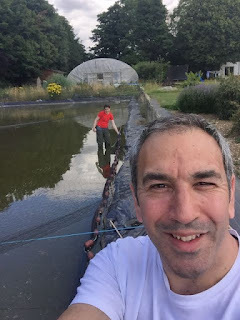 I’ve learned the hard way what happens if the ponds are not prepared properly – Remember the ‘Loch Ness Shiro’ situation? For those of you who’ve been reading my blogs since the beginning, you’ll remember that particular farce. A particularly painful experience from summer 2013. Basically, 2 small fry survived in a small puddle in an otherwise empty fry pond. And then proceeded to survive the filling process (with chlorinated water! 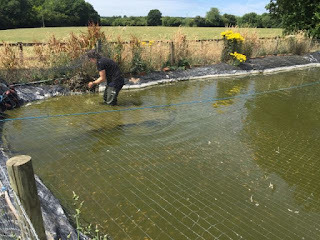 ), and then proceeded to eat most of the hard earned hatchlings that I subsequently introduced into the pond – decimating the harvest, and any last chance I had to make a success of the year. 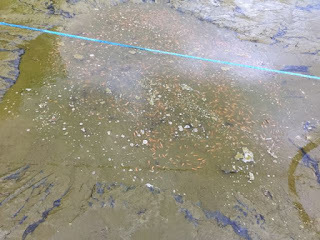 So, learning that lesson – after harvesting a fry pond, I drain it down and vacuum dry every puddle. We will spend several hours on this task, per pond. We then leave it for a few days to dry out, and this also helps to reduce lingering bugs that we don’t want in there. And then, the pond is ready for re-use. 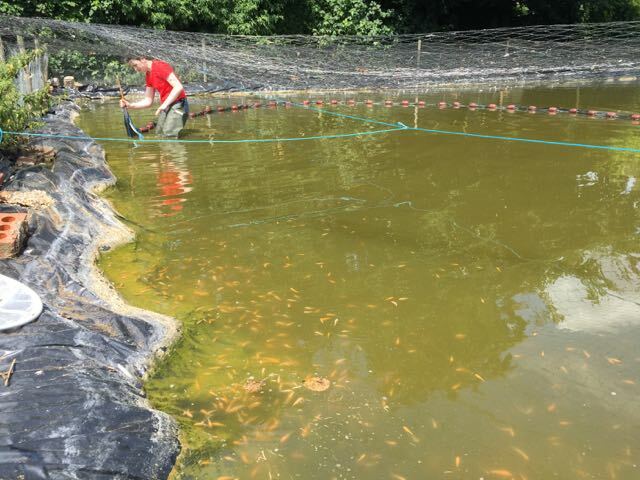 Last weekend, we harvested both ponds in full. 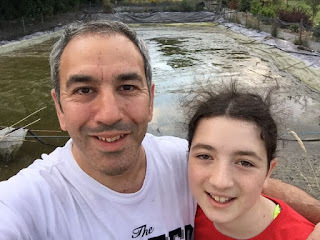 I emptied the bottom pond, and caught up the last couple of thousand of fry in the drainage sink, late on Sunday night with my daughter – who stepped in to help out. 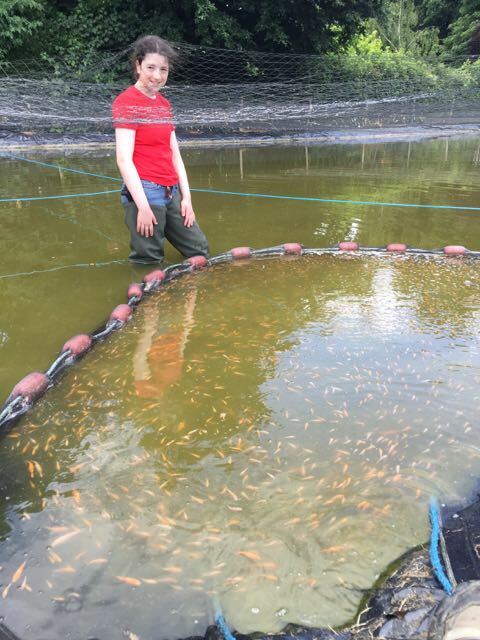 The last few fry retreat to the draining sink, which is where I've pumped out the pond from. 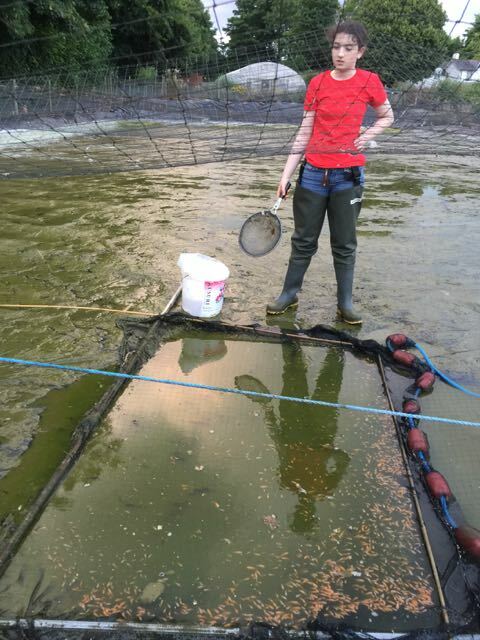 When pumping out, I use a screen around the pump so the water leaves the pond but the fry do not! Caught up , and ready to harvest these last few fry. 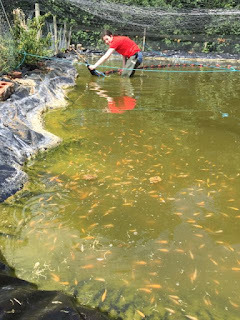 Now, the same needs to happen for the top pond. 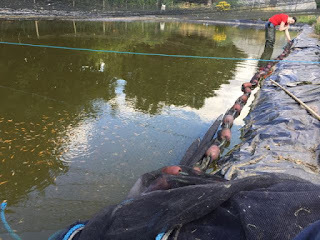 Then, we need to progress very quickly onto preparing the ponds so they are ready to go again – ideally this weekend. That may be a stretch, but that's what we're aiming for. The plan then is also to run mid-summer spawnings this weekend coming. 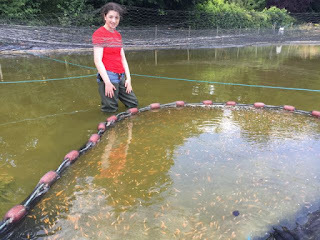 I have one female yet to spawn – the trusty okawa kohaku female. But the one I’m going to start with is sharkey. Yes, she spawned early May time – the tosai we have from her spawning last year are very promising, and I want to try for a second in season spawning with her before heading to the okawa option. That’s what I have in mind…. I’ll make a final decision when I examine both females just before spawning. 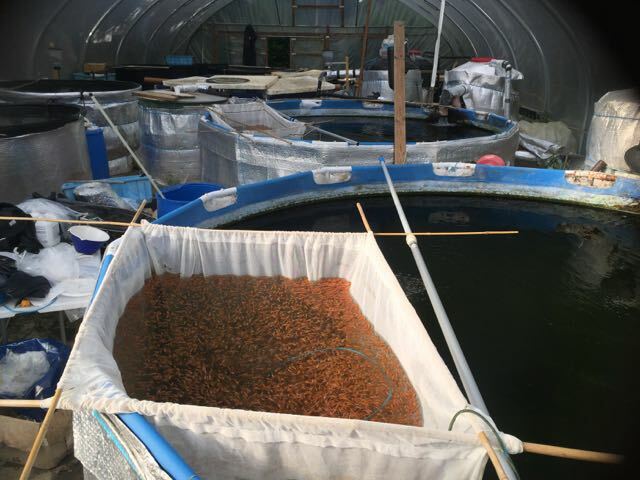 We’ll stop feeding both males and females tanks on Tuesday in preparation for potential spawnings this weekend. The harvest from the early summer spawnings has been the best we’ve ever achieved. Across both ponds, I estimate at least 50k fry harvested. And, it could be nearer 60k. That’s across the May 17 #1 and #2 spawnings – with a heavy skew to the #2 one. Here’s some pictures and video from the harvests. 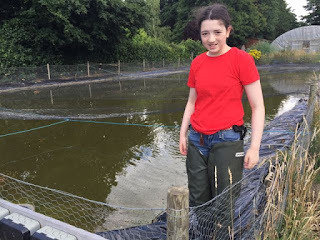 It was such a mammoth task, and my daughter stepping in on Sunday was brilliant support. The help she provided made a huge difference to my weekend, and it was a life highlight for me to be able to enjoy the activity with her. I also started to teach her what I’ll be looking for in selections, planned for this weekend. 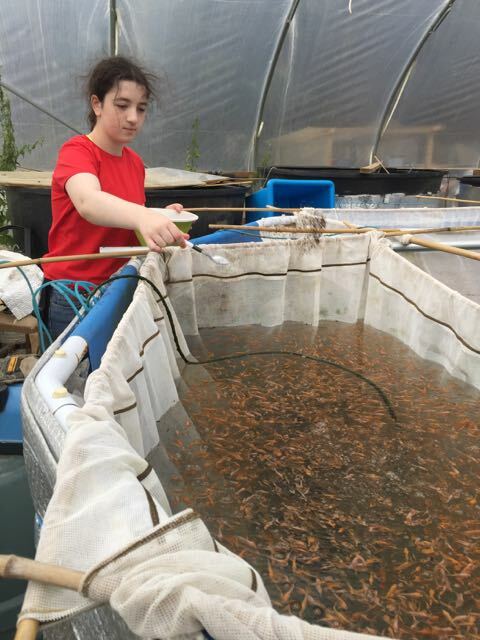 She has a great eye for koi. And I think she’ll be helping Amanda and I with that selection task too. 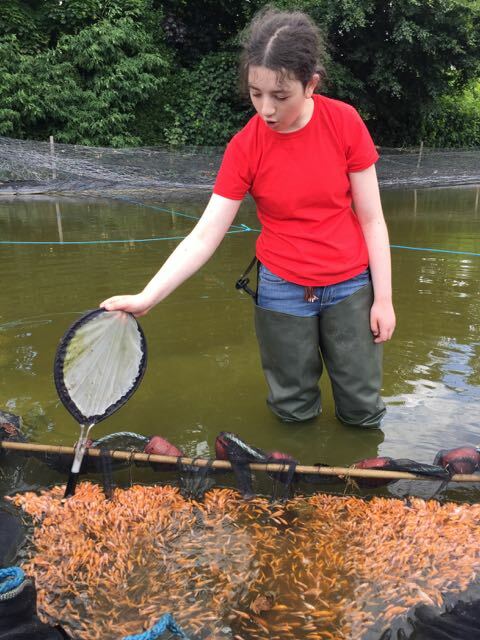 These fry are destined to be caught by our seine net! The reality is that I will need the help from the whole family to complete selections on these fry, if my estimate on fry numbers is anywhere near accurate. 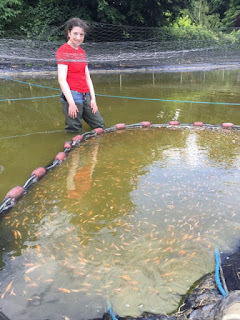 It’s going to be a big task, but this is where the quality starts to come from the project, and where my show potentials for next year come from - getting the selection right.